You’ve hit the jackpot! 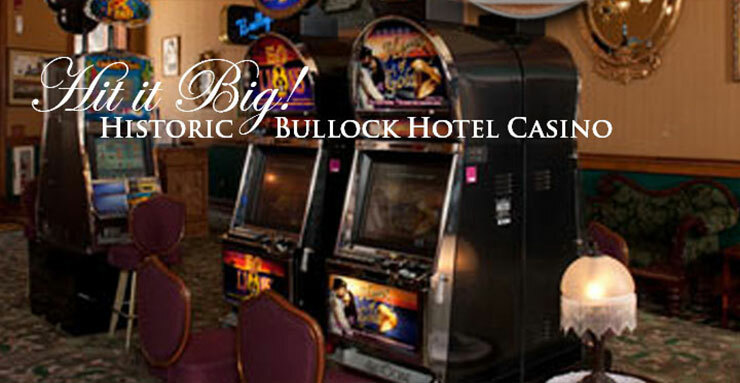 Historic Bullock Hotel Casino offers satisfying slots, from $.01 to $5.00 machines. If you miss the clink of real coins in the tray, be sure to visit Historic Bullock Hotel Casino. It will change your luck!! Our Casino offers complimentary wine, tap beer & sodas to players. Enjoy authentic Victorian atmosphere while playing your favorite slot machines. Open daily, 24 hours a day. Take time out to eat in our intimate restaurant, Bully’s. Full liquor bar with a wide variety of your favorite cocktails is available. Gambling devices have always been part of the unique atmosphere known as Deadwood. The slot machine itself has been a fixture in town from the very beginning…well, almost. Charles Fey of San Francisco is credited with designing the first slot machine in 1887, two years after the Historic Bullock Hotel was built. It is noted that within weeks of its invention, the first slots were on their way to Deadwood. Deadwood was the first jurisdiction outside of Nevada and Atlantic City in the United States that truly legalized gambling. And they did it in a unique way for the small community to use legal gambling revenues as a way of maintaining local historic qualities. On November 1, 1989, legalized gambling was once again alive and well in Deadwood! Since that time slot machines, poker and blackjack have been going strong and immediately brought significant new revenues and development for the City of Deadwood. Come on in to the Bullock Hotel and give ours a try…Seth will be watching. We offer many of the latest games, as well as a few of the old favorites. The slots are still hot and waiting just for you! !